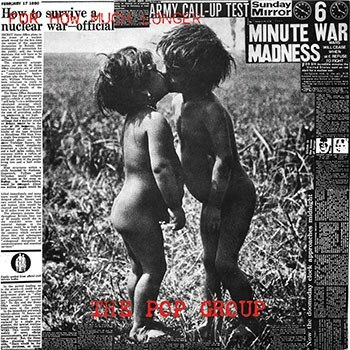 Harsh, abrasive, uncompromising and wholly unique, the Pop Group's sophomore album is as essential in 2016 as it was in 1980. While the Pop Group's moniker was tongue-in-cheek from the word go, the group's 1980 LP For How Much Longer Do We Tolerate Mass Murder took the group's unconventional approach to its logical conclusion. When one listens to it even now, it is no surprise that For How Much Longer ended up as the group's final studio album until their surprise reunion in 2015. The Pop Group had blown past all other post-punk acts and created a genre-defining (and genre-defying) epic, as fearsome and fearless as popular music can be. Drawing heavily from free jazz, African folk music and funk in addition to their more conventional disco and reggae influences, on For How Much Longer the Pop Group's sonic palette has an incredibly impressive depth. At times, the music is ready for the dancefloor, as in the Afro-funk tinged "Blind Faith", while songs like "There Are No Spectators" wrap dub basslines around harsh, alienating and sparse instrumentation. The one constant is that the rhythms are airtight throughout, with bassist Dan Catsis and drummer Bruce Smith the undeniable stars of the group. More troublesome are frontman Mark Stewart and saxophonist Gareth Sager, whose contributions practically define "acquired taste" and, depending on whether or not you've acquired that taste, their parts can easily be seen as song-ruining at times. Stewart's vocal style ranges wildly, from a Johnny Rotten-esque sneer ("Feed the Hungry", "Rob a Bank") to unearthly shrieking ("We Are All Prostitutes", "How Much Longer") and a few places in between, never staying in one place long enough for the listener to get accustomed to his current mode. Vocals can make or break albums for many, and anyone who finds the vocals in Primus songs hard to take would be advised to give the Pop Group a wide berth. Les Claypool's shtick, vocally, can be compared to Stewart's style after being watered down to a fraction of its original potency. Similarly, Sager's saxophone playing, more in tune with the album's free-jazz influences than its funk or dub ones, is most often characterized by abrupt blasts of noise. Sager uses the saxophone as one would a weapon, seeking to destroy melody rather than create -- instrumental track "Communicate" opens with some of the harshest sound one is likely to hear outside of explicitly-designated noise music, and he is no friendlier to the listener anywhere else. If the Pop Group's name were meant to be unironic, Sager could very easily be accused of ruining the album wholesale, but instead his instrumentation serves a very definite purpose; his unmelodic playing ensures that only the truly committed listener bothers to proceed. The grooves are there, and they're some of the best to be found in post-punk, but Sager makes sure the listener has to put in work to get to them. A lack of willingness to compromise anything for the sake of the listener characterizes every aspect of For How Much Longer Do We Tolerate Mass Murder?. Where much of their post-punk contemporaries' music danced around naming names or being too specific with political content, Mark Stewart pulled no punches. The title track's lyrics include the statement that "Nixon and Kissinger should be tried for war crimes" and "Justice" refers explicitly to the killings of activists Blair Peach and Kevin Gately. Ambiguity would have been too safe, too comfortable for the Pop Group. While it in no way makes for an entirely pleasant listening experience, the Pop Group's daring refusal to bow or conform to any standards of the popular music they named themselves in sarcastic defiance to is impressive and admirable to an extreme. They played by their own rules and created something unlike anything else that could be heard at the time, and now the album has been reissued to a musical climate that has gone three and a half decades without seeing anything else like it.